The BLUE Light PhotoDynamic Therapy kills the P. acnes bacteria in your skin. The BLUE Light can be administered alone or in conjunction with a topical application of ALA, or Levulan (aminolevulinic acid), for the treatment of acne vulgaris. Studies show that BLUE Light provides treatment for both active lesions and other inactive sebaceous glands that are not creating active lesions. Pretreatment with topical ALA may offer additional reduction of lesions, pustules, and papules. Bacteria multiplying in the sebaceous glands that surround hair follicles cause acne. The results range from the common pimple to severe acne. The key is to get rid of the bacteria while not harming the skin. Some people use topical creams, special cleansers, or even opt for oral medication. However these solutions do not work for everybody for a myriad of reasons. The BLUE Light is an amazing treatment that eliminates the bacteria that causes acne. When the skin is exposed to BLUE Light, the light enters the sebaceous glands that harbor the bacteria. In turn the sebaceous gland create oxygen molecules that then destroy the bacteria and help the healing process. With the bacteria gone, the acne begins to clear up and the skin begins to heal. Acne can affect us at almost any age, typically it begins during adolescence, when hormonal changes cause the enlargement and obstruction of sebaceous glands in the skin. Consequently, many people experience an abnormal proliferation of bacteria, predominantly propionibacterium acnes (P. acnes). This typically causes painful, inflamed lesions that can appear on the face, chest, back, limbs and virtually any other part of the body. While most individuals will eventually outgrow their acne, some will remain susceptible to it throughout their lives. Even for those who no longer generate new symptoms, permanent scarring frequently results. Now, you can clear mild to moderate inflammatory acne without side effects, discomfort, photosensitivity or downtime. Acne Clearing treatments utilize a high intensity enhanced light source to permeate the tissue to destroy acne bacteria quickly and easily - with no side effects, no downtime, no pain, and without the exposure to antibiotics. Typically, just ten treatments over a four week period will greatly improve the appearance of skin. BLUE Light Acne PhotoClearing™ is great for teens and adults and can help heal and clear your face of acne. What is the Bellafill Filler Difference? If you are looking for an injectable wrinkle filler that provides long lasting wrinkle correction, then you have finally found your answer in bellafill. Bellafill’s microsphere-enhanced collagen support works to correct wrinkles for long lasting results. Temporary wrinkle fillers have always been know as just that, temporary. The body eventually absorbs them thus forcing patients to receive frequent repeat injections to maintain the results they love. Bellafill fillers are different from temporary injectable wrinkle fillers because it is made up of microsheres, which the body does not absorb, creating the long lasting results that you have been searching for. Bellafill injections provide the support your skin needs for long lasting results that look and feel completely natural. The results are economical and extremely convenient because it requires fewer injections, thus saving you time and money. Say goodbye to the injectable wrinkle fillers of the past and hello to the ease of Bellafill! Bellafill is the latest in cosmetic fillers providing the much desired longer lasting results for your unwanted lines. Most fillers act as a temporary solution- being absorbed by the body after time forcing patients to receive frequent repeat injections to maintain the results they love. Bellafill’s unique make up prevents it from being absorbed in the body giving patient’s up to five years of smooth skin saving you time and money. Bellafill® is collagen-based allowing it to provide immediate volume and lift to correct wrinkles, unwanted lines and even acne scars. Once injected, these microspheres stay in place and create a base that provides structural support for smoother-looking skin, over a longer period of time. Why struggle with the hassles of frequent repeat injections when the solution is clear? Say goodbye to the injectable wrinkle fillers of the past and hello to the ease of Bellafill! Millions fight the signs of aging with Botox treatments. BOTOX® Cosmetic safely and effectively softens and relaxes unwanted lines on the face, forehead or around the eyes including frown lines and crow’s feet. Botox injections work by blocking the nerve signals responsible for motion to the muscles, temporarily paralyzing the muscle, causing the appearance of wrinkles to naturally fade giving you a fresh, youthful appearance. A single Botox treatment at DermaVogue takes about 10 minutes and consists of a series of quick, pain free, injections. Within 24-48 hours you will see significant improvement in your treatment area. The duration of your results may vary, but BOTOX® Cosmetic results generally last up to 4 months. Our Medical Director, Dr. Jim Turek, personally administers all injections at DermaVogue putting our patients in only the best care. BOTOX® Cosmetic also has a preventative effect as it stops the muscles from making habitual movements that cause future lines and wrinkles as well as the preventing the depth and severity of current lines. Chemical peels, also known as chemical resurfacing, are chemical treatments to produce an improved appearance of the face. Chemical peels are used for the treatment of photoaging (from sun damage), wrinkles, scarring, acne, precancerous lesions, and discoloration (or dyschromia). Chemical peels produce controlled injury to the skin that promotes the growth of new skin with an improved appearance. Chemical peels have been used for decades to revitalize and resurface skin. They involve applying a chemical solution to remove the damaged outer layers of skin and reveal a younger, clearer, more radiant complexion. Chemical peels are traditionally performed on the face, hands, neck, back and shoulders, legs and other problem areas to treat fine lines, wrinkles, age spots, and skin discoloration. Chemical peels are also effective in treating mild scarring and acne. Treatments usually last from 15 to 20 minutes and are one of the most effective ways to rejuvenate aging skin, and erase the marks of sun damage. Hydrafacial uses multiple layers of exfoliating products, unique disposable exfoliation heads and suction to gently resurface the skin. There are multiple variations to the treatment that your provider can help you to choose. Here at DermaVogue, because we operate with a physician, we can do treatments that are more effective than a day spa can. This is an advantage to clients who want truly significant results. Hydrafacial is invigorating and can be completed in as little as 30 minutes. It is for all skin types; sensitive, aging, sun damaged and acneic. It extracts impurities and dead skin cells and bathes the new skin with cleansing, hydrating and moisturizing serums. The treatment soothes, refreshes, hydrates and moisturizes the skin. The best is it is non-irritating. Once skin is exfoliated, it will receive at-home treatments more easily. When serums and moisturizers are applied to skin that is occluded with dull, dry skin, the products cannot do their best delivery to treat the skin. Many clients report visible skin refinement and even, radiant skin tone after just one treatment. The results may last 5 to 7 days or even longer. One treatment per months is recommended for improving the appearance of fine lines, wrinkles, brown spots, oily and congested skin. Continuing treatments will help to maintain skin health results. The focus of these treatments is skin health. You can put on makeup and return to normal activities immediately after receiving your hydrafacial treatment. There are 3 steps to beautiful skin using the hydrafacial. The first step is to cleanse and peel the skin with varying percentages of fruity acids and an exfoliation head with suction. This reveals a new layer of skin that is clean and relaxed. Because 90% of the damage to our skin is caused by the sun, the second step is to extract pores in the T-Zone and nourish the skin with intense moisturizers that rehydrate and quench the skin. The third step is to fuse and protect by saturating the skin’s surface with antioxidants and peptides. As with all facials, additional serums, moisturizers and an SPF are applied by hand to complete the facial. Juvéderm is a non-animal based injectable filler made in the laboratory. It is made of hyaluronic acid - a material that is in the joints and bodies of all living things. A simple, non surgical, physician-administered treatment, Juvéderm injectable gel can temporarily add volume and diminish wrinkles and folds in areas like your "laugh lines," "smile lines" "frown lines", "marionette lines", it can also be used to enhance the lips. JUVÉDERM VOLUMA XC injectable gel is the first and only filler FDA-approved to instantly add volume to the cheek area. It gives you a subtle lift, helping to restore contour and a more youthful profile, for up to 2 years. What else should you know about JUVEDERM VOLUMA XC? It's different than JUVÉDERM XC and works on a different area of the face. JUVÉDERM XC smoothes out moderate to severe wrinkles and folds around the nose and mouth like parentheses. JUVÉDERM VOLUMA XC, however, adds volume to the cheek area. Why should you choose JUVEDERM VOLUMA XC? Hyaluronic Acid (HA) is a naturally occurring, hydrating substance found in your skin. As you age, you start to lose HA, which causes the skin to lose structure and volume. So there is no need for allergy testing. Kybella is an FDA approved injectable used under the chin to improve the appearance of moderate to severe fat beneath the chin. This injection physically destroys the fat cells. In a period of weeks after the injection, the interesting result is the skin will spontaneously tighten and the jawline will appear smoother and more youthful. We at DermaVogue started treating patients with Kybella in 2015. Dr. Turek is experienced and we have enjoyed great success with our patients. Like most of us, you’ve probably wished for a way to really make your eyes POP! That wish was finally granted in February of 2009 when Allergan released Latisse on the market. Latisse is the first and only FDA approved prescription treatment which makes your own lashes become fuller, darker, and longer in as little as 16 weeks. The results are truly astounding. Take a look at the representative before and after client and the progressive improvement seen at 1, 8, and 16 weeks with Latisse. There are similar photos on the Latisse website: www.latisse.com. The MicroLaser Peel is performed using a Sciton laser which is now recognized as a preferred method of skin resurfacing. This advanced Sciton laser skin rejuvenating treatment precisely removes the outer most layer of skin. The removal of the dead layer and the thin layers of the epidermis helps smooth the skin's surface while blending irregular pigmented age spots at the same time. The best candidates for MicroLaser Peels are individuals who want more improvement than what Microdermabrasion or Light Chemical Peels offer but don't want more than a few days of downtime. Although Microdermabrasion and Light Chemical Peels offer very effective deep exfoliation at a depth of up to 5 microns, the MicroLaser Peel can remove 10 to 30 microns of the epidermal surface, offering patients more dramatic improvement. For comparison purposes, one MicroLaser Peel at the lowest setting (10 microns) is equal to approximately five medical-grade Microdermabrasion treatments performed every two weeks. If you're searching for a surgery alternative to looking as young as you feel then a MicroLaser Peel may be for you. Many people don't realize when they are younger the effects the sun & the wind have on their skin. Some people say they don't look as young as they feel & they want they want that younger looking, healthier feeling skin back. The "weekend" skin peel, the MicroLaser Peel, treats skin conditions associated with aging and an active lifestyle. You can see real improvements in just a few days. Your physician can advise you on how best to protect your skin to maintain the benefits you will see from your MicroLaser Peel, and can answer any questions you might have. Typically, the MicroLaser Peel takes from 15minutes to 1 hour to perform & depending upon desired results, 2-4 treatments may be necessary. You will experience smoother, healthier, more vibrant skin, with a significant, immediate change in skin texture and tightness as compared to microdermabrasion. Which MicroLaser Peel is Right for You? As mentioned above, a MicroLaser Peel treatment typically takes from 15 minutes to 1 hour. Before the procedure: Although most patients are essentially pain free during this procedure. We use the latest technology to minimize any discomfort. We also apply our especially formulated highly effective pre-treatment topical anesthetic cream. This is sufficient for most patients. As an additional measure, we use the Zimmer cold air device, which gently blows cold air against the skin, to facilitate comfort. As every person has a different threshold for pain, for those especially sensitive patients, we have developed other protocols to ensure that the treatment is extremely comfortable and tolerable allowing you to fully enjoy the results without pain. Most individuals experience smoother, healthier, more vibrant skin, with an immediate improvement in skin texture and tightness. Your skin should continue to improve over 6 months of time due to increased collagen stimulation in the deeper layers of your skin. The number of MicroLaser Peels you will need depends on your skin condition and the desired result. Our skin health specialists will recommend the number of treatments needed for you to achieve your desired result. Improve or eliminate superficial skin problems with a Microdermabrasion treatment. Microdermabrasion is a non-chemical and non-invasive procedure that removes the outermost layer of dry, dead skin cells to reveal younger, healthier-looking skin. Microdermabrasion treatment also encourages the production of a new layer of skin cells containing higher levels of collagen and elastin, both of which further improve your skin's appearance. Microdermabrasion can improve or eliminate superficial skin problems. It works on all skin types and colors to produce subtle changes, causing no skin color change or scarring. However, it is not effective for deeper problems like scars, stretch marks, keloids (an overgrowth of scar tissue at the site of a healed skin surgery) or deep acne scars. Radiesse is one of the latest injectable fillers that is available for cosmetic purposes to fill in wrinkles and lines. Radiesse is made up of microscopic calcium particles (hydroxylapatite) that are found in bone and suspended in gel. Safe & Long-Lasting Treatment to Enhance Facial Features. Imagine A More Vibrant You! Over time, lines and creases naturally appear on the face, and lips lose some of their fullness. Until now, however, there has been no safe and long-lasting treatment to reverse this process. Introducing Radiesse, the first truly safe and enduring way to restore vitality to the face. The advantage of using Radiesse is the potential for long lasting effect. Radiesse will last approximately 7 to 12 months (about 2 - 4 times longer than collagen). Radiesse contains no animal products and therefore requires no allergy test prior to treatments. One cc of Radiesse can treat about twice as many areas as 1cc of traditional filler. Radiesse is also often more natural appearing and feeling. You can receive Radiesse treatments from your physician in a simple safe procedure that takes about 15 minutes. As Radiesse is gently injected, it builds up the tissues of the face, reducing folds and creases and restoring fullness. It does not paralyze or act of the face's muscles. Enhancement with Radiesse is relatively painless, and any minor swelling from the injection typically disappears within 24 hours. You can comfortably return to normal activities after your treatment. Unlike other fillers, Radiesse is not absorbed by your system. Therefore, there is no need to over-fill the wrinkle. Best of all, you'll see results immediately. Achieving the youthful look you desire is as easy as it is quick with Restylane. Restylane injections are FDA approved for the treatment of facial wrinkles. They are safe and effective for filling moderate to severe wrinkles. Because Restylane is non-animal-based and fully bio compatible, allergy testing is not required. This means that you can have the Restylane treatment immediately. Treatments can take less than thirty minutes, depending on the correction to be performed. When injected into the skin, Restylane produces volume that smoothes the wrinkle or fold, shapes the facial contour or enhances lips in a natural way. Restylane injections are safe and fast, leaving no scars or other traces on the face. Sculptra is the only facial injectable designed to stimulate collagen with results that last over two years. Facial collagen loss is a key factor in an aging appearance. Collagen acts as a support structure for your skin, provides overall volume and gives shape to your face. At about 30, collagen loss decreases elasticity and moisture. Sculptra Aesthetic stimulates collagen helping to replenish lost volume. 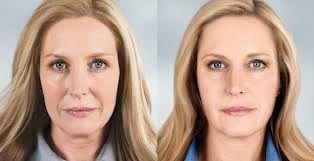 Sculptra Aesthetic, or poly-L-lactic acid is a unique facial injectable that replaces collagen lost during the aging process. Sculptra Aesthetic is the only volumizer scientifically designed to stimulate natural collagen growth and lasts more than two years. Traditional dermal fillers only address wrinkles, lines and folds; Sculptra Aesthetic works differently. It replenishes lost volume by stimulating growth of your own natural collagen to treat the underlying causes of facial aging. Sculptra Aesthetic can restore a more youthful, natural look that lasts more than 2 years. Sculptra Aesthetic is used to correct shallow to deep facial wrinkles and folds, by treating them with the appropriate injection technique. Sculptra Aesthetic helps your body to regrow your own collagen over an extended period. With Sculptra Aesthetic you can expect to see a subtle, steady improvement in lines and wrinkles, resulting in a more youthful look. In pivotal clinical trials that measure improvement in wrinkle assessment scores, Sculptra Aesthetic had results that last over 2 years compared to injected collagen, which lasted less than 3 months.